Associated Press Striking teachers carry placards as they walk a picket outside South High School early Monday in Denver. The dispute is over the school district's incentive-based pay system. Science teacher Abraham Cespedes said Denver educators were empowered by recent teacher activism elsewhere around the country. “By us doing this we finally became united,” he said. 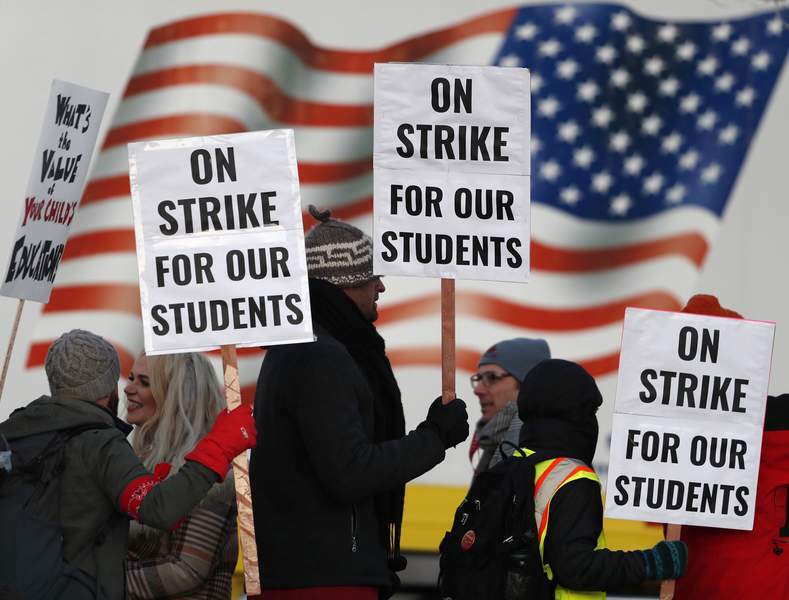 The strike affecting 71,000 students in Denver comes about a year after West Virginia teachers launched the national “Red4Ed” movement with a nine-day strike in which they won 5 percent pay raises. There have since been walkouts in Washington state, Arizona, Kentucky, Oklahoma and Los Angeles. The head of the National Education Association, the country's largest teachers union, told several thousand cheering Denver teachers and supporters Monday they will prevail. “You are unique here in Denver because you are just saying, 'Can I just know what I'm being paid?' “ Lily Eskelsen Garcia said at a rally outside the state Capitol. The dispute is over the school district's incentive-based pay system. The city's school district gives bonuses ranging from $1,500 to $3,000 a year to teachers who work with students from low-income families, in schools that are designated high priority or in positions that are considered hard to staff, such as special education and speech language pathology. The union is pushing to lower or eliminate some bonuses to free up more money for overall teacher pay. The district sees the disputed bonuses as key to boosting the academic performance of poor and minority students. District Superintendent Susana Cordova said negotiations will resume today, an announcement confirmed by the union.